The best modern quilts from around the world, over 200 of them, have been selected by the Modern Quilt Guild to be included in Modern Quilts: Designs of the New Century. I am thrilled to have two quilts chosen to be in the book which will include large, color photographs of each quilt. 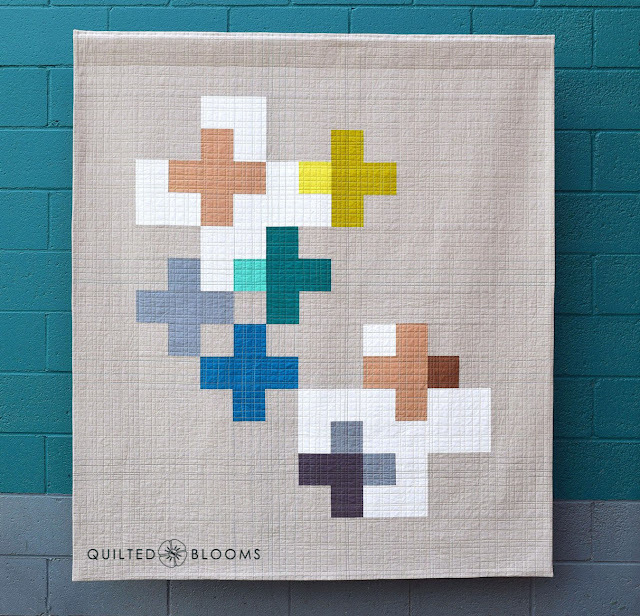 For those of you new to Quilted Blooms, WELCOME! You can read a little more about me here and see some of my finished quilts here. But, back in August 2013, I joined the MQG as an individual member. And then, in December 2014, I was instrumental in the formation of the Greenville MQG where I serve as treasurer. The Greenville MQG issued a challenge to its members in 2016 to create a modern quilt using only black and white fabrics (some gray was permissible) and one pop of color. Cursive is the result of the challenge and received 1st place. Cursive also won 2nd place at QuiltCon 2017 in the small quilts category in Savannah, GA and went on to travel the world in the Best of QuiltCon Traveling Exhibit. 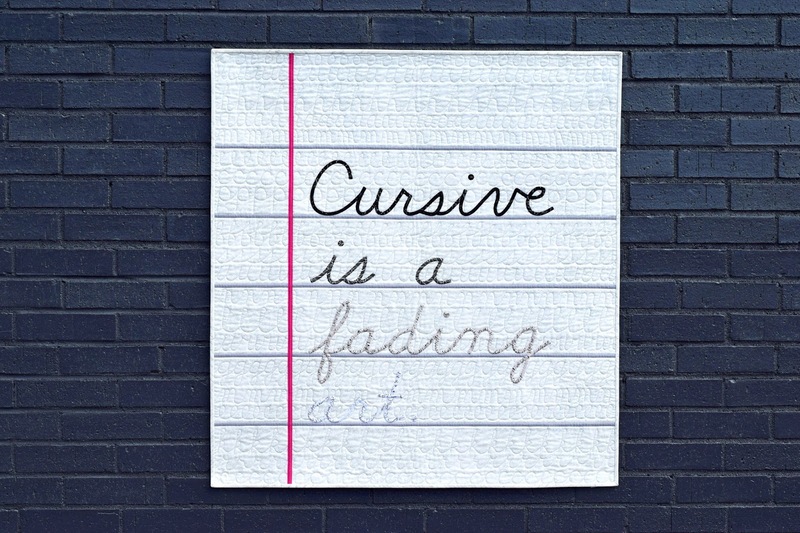 Cursive is made from all text or text related fabrics except for two solids. The words were made from bias tape and hand appliqued. It was even quilted in cursive letters with D'Nealian Handwriting using Aurifil thread. 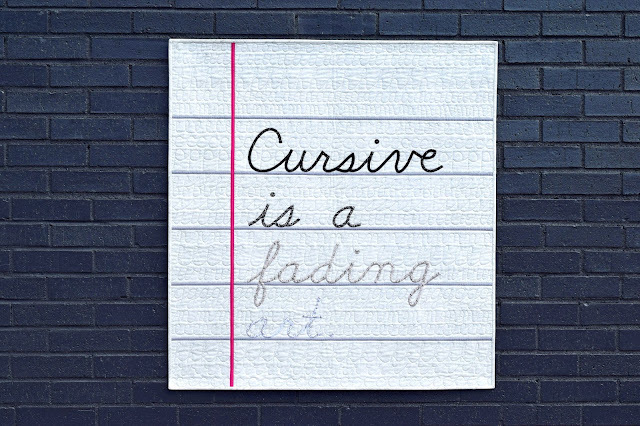 You can read more about the making of Cursive here. Positively Transparent displayed at QuiltCon West (2016) in Pasadena, CA, also in the small quilts category (36" or smaller on each side). Positively Transparent was started in a class with Lizzy House focusing on the elements and principle of design. It is a transparency design and includes the ever-popular plus sign of which I am quite fond. Though Positively Transparent is small, measuring just 16" x 18", it involved many hours of walking foot quilting until I decided it or I had had enough. You can read all about the making of Positively Transparent here. I enlarged Positively Transparent to a lap size and it became the MQG's Quilt of the Month for August 2017. Receiving a free modern quilt pattern each month is just one of the many benefits of joining the Modern Quilt Guild. You can search for a local MQG in your area here. The 208 page book was curated by Riane Menardi, Alissa Haight Carlton and Heater Grant, all leaders of the Modern Quilt Guild and published by Stash Books/C&T Publishing. 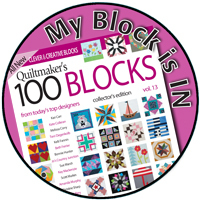 100% of royalties earned from this book go the Modern Quilt Guild, a non-profit 501(c)3 organization. 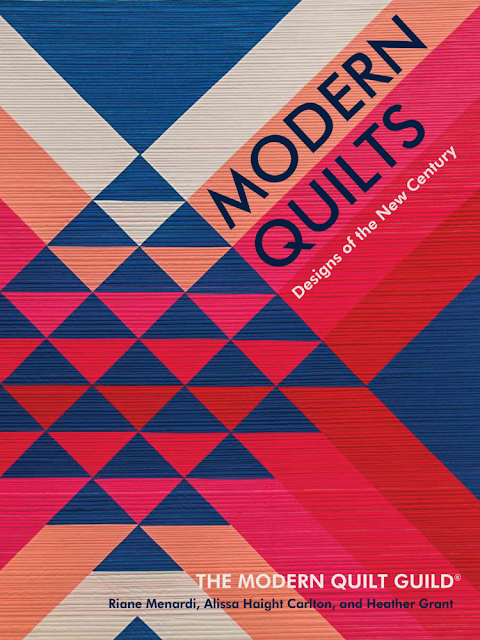 Modern Quilts: Designs of the New Century is expected to ship any day now and can be purchased on Amazon here or directly from the MQG here. Be sure to visit all the bloggers on the tour to see more beautiful quilts included in Modern Quilts: Designs of the New Century. 12/20/17 Paige Alexander Quilted Blooms ⬅ You are here! 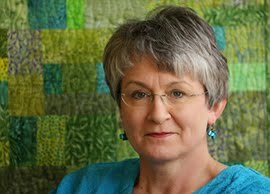 I hope to see you at QuiltCon in Feburary 2018 in Pasadena, CA! 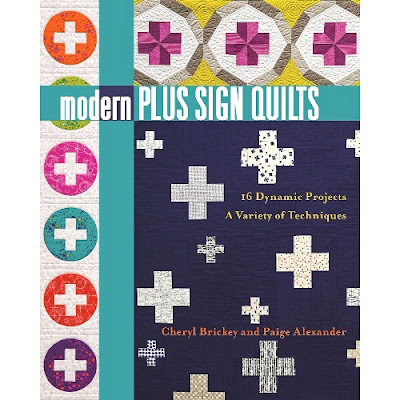 I'm pretty excited as I will have 4 quilts hanging at QuiltCon and will be promoting my my new book, Modern Plus Sign Quilts, co-authored with Cheryl Brickey, also published by Stash Books. Some links included in this post are affiliate links meaning, at no additional cost to you, I may earn a small commission if you purchase through my link. Thank you! Your two quilts in the book is fabulous. Looking forward to the book's release. Will visit the other bloggers on the tour. Cursive will always be one of my favorite quilts! I am so excited for you, Paige, not only for you getting to be at QuiltCon but especially for the release of your book. How fun and exciting! I echo piecefulwendy. Cursive is just one of the most clever designs I've ever seen. Not to mention all of your work is so precise and the attention to detail is outstanding. Congratulations on this big honor, Paige! 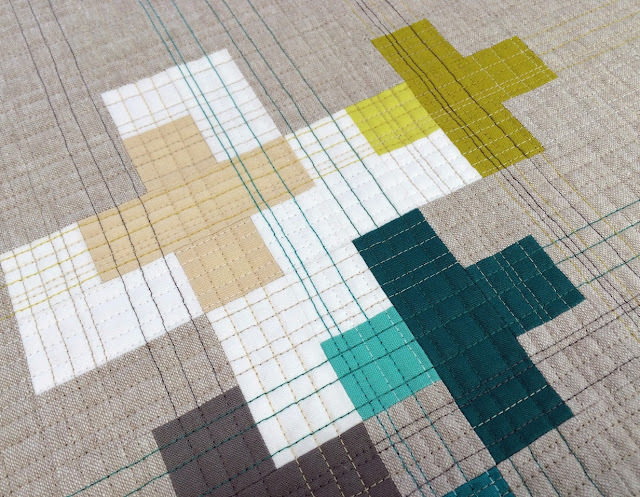 Your work is innovative and perfect, I love seeing your quilts in person and in print! Congratulations, Paige! Both of these quilt definitely deserve to be in this book! I've loved Cursive every since you've posted about it. I haven't seen you on IG amongst all the other #quiltconrejects , so I was sure you had received positive news. Yay! I'm thrilled for you to have had four quilts accepted. Even the last-minute finished one? I hope so. This is so extremely commendable as the jurying process is certainly incomprehensible and subjective. I'm glad you're in the elite crowd! And congratulations on having two quilts in the book. 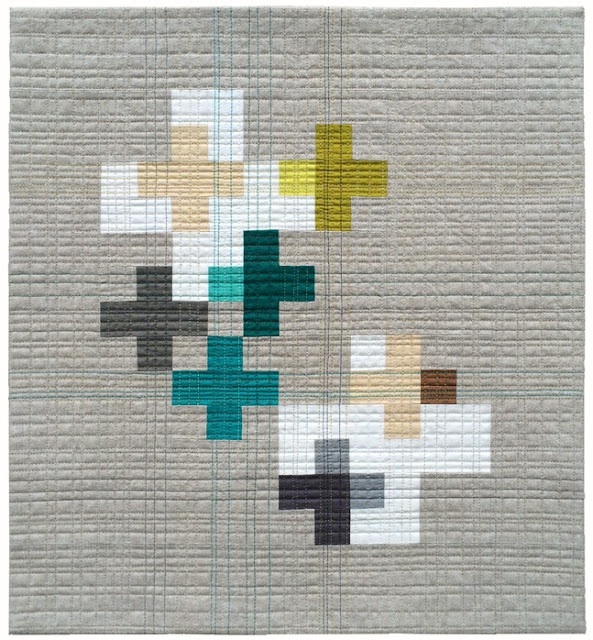 You do amazing modern quilting, Paige, and I only wish you were closer, to be in our MQG chapter, or be my neighbor so I could pick your modernistic brain about how to come up with "modern." You've definitely got it pegged! Congratulations on all fronts. 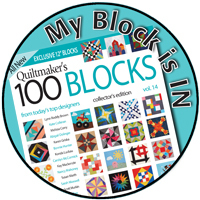 It is fun to see some of the quilts that will appear in the MQG book as I anxiously await my copy! I'm looking forward to seeing you and your quilts in Pasadena, as well as your new book on Plus Quilts. See you in February! 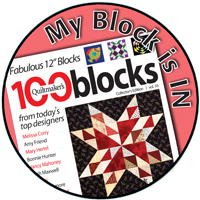 Congrats on being in the book - love both of these quilts! Congratulations, Paige! 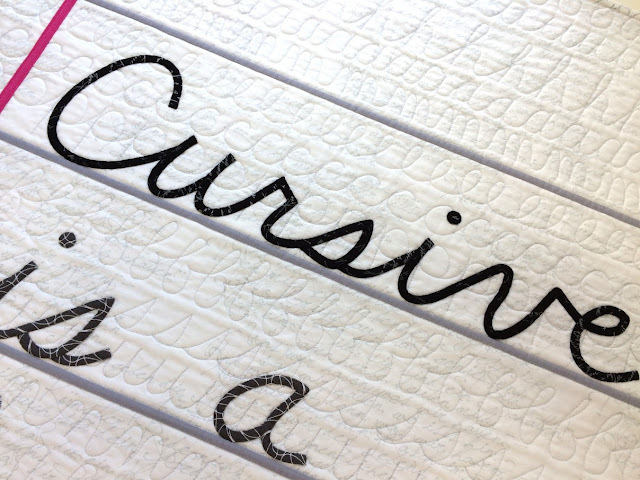 As soon as you said you had two quilts in the book, I knew Cursive had to be one of them! 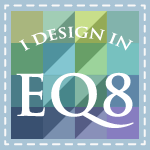 Congrats as well as having 4 quilts in QuiltCon next year! I won't make it to Pasadena but am considering Nashville in 2019. Congrats Paige! It's an honor that is well deserved! I look forward to hearing how your quilts do at QuiltCon in 2018. 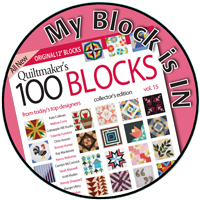 Congratulations on having two quilts in this neat book! I sure wish I could attend QuiltCon and maybe have a chance to meet you. Perhaps another year. I hope you're having a lovely holiday season! Congratulations Paige ! Your perfect work and interesting designs deserve to be featured. I'll definitely order a copy of this book ! Wow, fantastic news Paige. They are both wonderful quilts although Cursive is my favourite, such a clever design. I’m so happy for you. Congratulations again! Fantastic work and so pleased you are featured twice! Happiest of be years to you and yours. Cursive is an amazing quilt. So creative.